Ukraine will provide technical support for Pakistani tanks. Ukraine and Pakistan have signed a 600m-dollar memorandum of understanding (MoU), the Ukrainian Defence Ministry's press service said on 23 November. 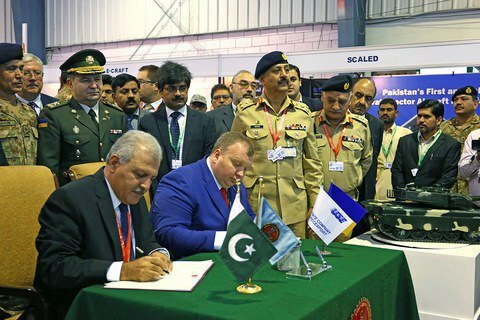 The MoU was signed by Pavlo Bukin, the CEO of Ukraine's defence exporter Ukrspetseksport, and the board chairman of the Pakistani corporation Heavy Industries Taxila, Syed Wajid Hussain. As agreed, Ukraine will provide technical support and engines for 200 AL-Khalid Tanks built in Pakistan. In the 1990s, Ukraine sold Pakistan 320 T-80UD tanks . Pakistan has also showed interest in the Ukrainian tank Oplot. During the visit, Ukrainian Defence Minister Stepan Poltorak discussed the prospects for joint production of tanks and anti-tank systems. In 2011, Ukraine signed a 200m-dollar contract to supply 49 tanks Oplot to Thailand. The deliveries have been completed by 50 per cent to date. In 2009, Ukraine signed a contract to upgrade 105 military aircraft An-32 for India. By the end of 2015, Ukraine repaired 40 Ans, the rest is going to be modernized at an Indian plant in Kanpur.